We are St. Louis Wildlife, Inc. a full-service wildlife removal company servicing the greater Saint Louis MO area. We resolve conflicts with unwanted groundhogs. When Can You Solve My Groundhog Problem? Common problems caused by groundhog include: digging large burrows on the property, and eating garden or other plants. 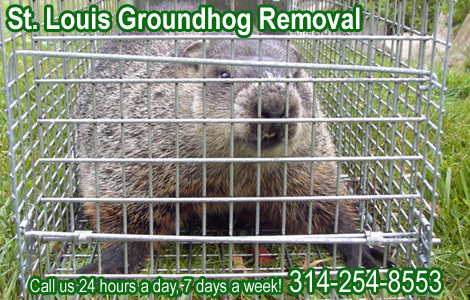 Our company specializes in wild animal control, including St. Louis groundhog removal. We are not a pest control company, or an exterminator. We deal strictly with wild animals. We are also not the Saint Louis county animal control, and we do charge for our services. What To Do If Poison Does Not Kill Groundhog - If you are trying to exterminate a groundhog there is always the chance that something may go wrong. First of all, there is no regisgtered woodchuck poison, and it's not legal to attempt to kill them in this way. In more than just a few cases rat poison does not actually kill groundhogs. The reason for the groundhog’s resistance is that rat poison is not made for a groundhog’s composition. Poison is not something that is recommended in the first place not only because it is ineffective, but it is also inhumane. There is also a chance that the groundhog will not eat the rat poison because groundhogs unlike rats are more selective about their diet, and may decide that they do not care for the poison. So what to do if poison does not kill groundhog? In those cases you should use traps. Traps are the single most effective way to get rid of groundhogs, so they should always be your first choice. The traps are more effective and because you are using it from the start you do not have to worry about the extra money that you would spend on the poison. To make it very clear, poison does not work as much as half the time so it is incredibly ineffective against groundhogs. Traps on the other hand will get the job fast and right.